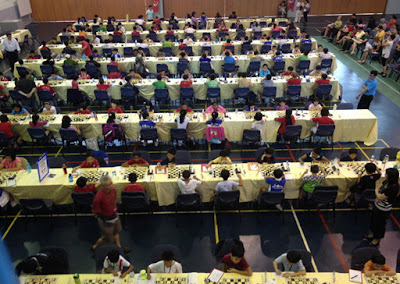 The latest chess news via Fide is that the The first ASEAN International Youth Chess Championships 2012 was held in Singapore from August 6-12. The total prize fund was $ 44,000 - one of the highest in the region. Participants won prizes in eight categories in the tournament organised jointly by the Singapore Chess Federation and Nanyang Primary School. 2011 World Youth Under-10 champion from China, FM Zhu Yi won the gold in the Under-11 Open category. Another Chinese, Pang Tao won the silver. FM Zhu Yi lost only one game in the tournament to Singapore’s Cyrus Low Zhen Yu. Vincentius Pradnya from Indonesia won the bronze medal. Lye Lik Zang and Ng Shi Yang from Malaysia won the gold and silver medals in the Open Under 8 category. Nisban Cyrus won the bronze. Indonesia’s Azarya Jodi Setyaki was the best performer of the entire championships with a perfect score of 9 points in the Under 14 Open category. Second place in the category went to Vietnamese CM Nguyen Van Toan Thanh. Hong Kong’s Wong Yee Chit won the bronze medal. Eleven-year-old Liu Xiangyi from China won the gold in the Under 17 Open category ahead of Mohammad Agus Kurniawan from Indonesia. In the Girls’ sections, Malaysia's Teh De Zen won the Under 11 category. Ananya Rishi Gupta from India won the Under 8 category. Singapore’s WFM Danielle Ho En Huei won the gold in the Under 17 title and Deodhar Vrushali Umesh from India won the Under 14 category. So lovely to see so many children enjoying chess! Wow, this game is so much popular, right?